Have you ever driven by a restaurant and said, "Wow! What a cool looking place! I can't wait to eat there!" Well, we have. 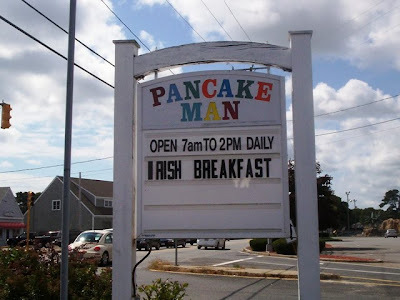 On a recent drive up scenic Route 28 in South Yarmouth, we came across a restaurant called The Pancake Man. The colorful sign was being held up by two happy cartoon chefs that seemed to be calling our names. Since it was closed, and since we had already eaten, we made a mental note of this place and vowed to one day visit. Well, today was the day! Mom and I decided to wake up early and drive all the way to South Yarmouth just for pancakes. Sure they have pancakes in Fall River, but not from The Pancake Man! We pulled into the parking lot at 11:45 a.m.
See Mom's waving hand above my SUV? She's giving a shout out to her fans. When we got inside, we approached the cashier's desk and asked the hostess for a table for two. The hostess led us to a table and told us that our waitress - who we later learned was named Ellen - would be with us in a moment. For a second I wondered why the hostess had not given us menus, but as I looked down at the table, I realized why. The place mats were the menus. What a great idea! Mom and I moved the preset silverware aside and started to pick out what we wanted. We were soon greeted by Ellen, who asked us what we wanted to drink. Both Mom and I chose two iced coffees ($1.99 each). When Ellen returned with the coffees, she took our order. Mom ordered the peanut butter chocolate chip pancakes ($6.79) and I went with the apple cinnamon pancakes ($6.99). We also ordered a side of applewood smoked bacon ($3.50) for some added protein. After Ellen left to put our order in, Mom and I checked out the dining room. The inside of The Pancake Man is actually a lot bigger than we expected. I guess it is because the building is longer horizontally than it is vertically. Plus, it looks bigger because of the beautiful open ceiling with exposed rafters. There are several tables at each end of the building, and a small desk area in the center of the room where you can buy t-shirts and assorted memorabilia. 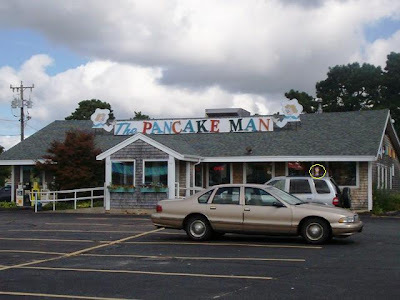 After checking out their adorable Web site, I was shocked to learn that The Pancake Man opened in 1961, and we just discovered it! They also have a picture of their original 1961 menu. I can't believe the apple pancakes I ordered only cost $.90 back then. How times have changed! So far, The Pancake Man was living up to our expectations, although we were surprised that there weren't more pancake flavor options. They had the standard flavors like chocolate chip and blueberry, but Mom and I were thinking that there would be a lot more choices. Perhaps the "crazy" pancakes don't sell well, and that's why The Pancake Man tends to stay with the more traditional types. When Ellen brought out our breakfasts, both Mom and I were pleased at how nicely they were presented. We were each given four large pancakes. Mom's cakes were loaded with peanut butter and chocolate chips, and topped with a large dollop of whipped cream and a chocolate drizzle. They were served piping hot, and because of the whipped cream, they really didn't need any butter or syrup. Mom said that they were very moist and she was surprised at how light and fluffy they were. She thought that four large pancakes with this type of topping would be quite heavy, but instead Mom said they were very easy to eat. The bacon was absolutely delicious. Both Mom and I were wishing that there were more than just three pieces, but for $3.50, we got a good bargain. Cut thick, the bacon was very meaty, and the applewood taste was fantastic. We'll definitely get another side of bacon with whatever we order on our next visit. We could smell my apple cinnamon pancakes before Ellen placed them in front of me. 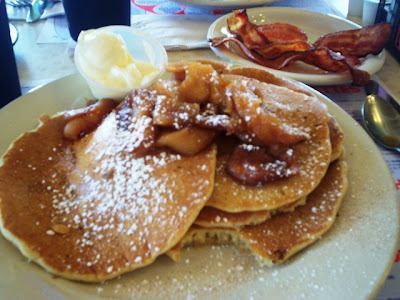 The fresh apples could be found both on top and inside of the pancakes, which kept the cakes nice and hot throughout the meal. Topped with a small dusting of powered sugar and accompanied by a small cup of butter, these pancakes also didn't need syrup (although I did pour a little bit on top of them). Like Mom's, my cakes were light, fluffy, and left me full without feeling stuffed. They were excellent and totally made the drive to South Yarmouth worthwhile. For some reason, they charged us $.25 less for the bacon. Perhaps it is because she paired the bacon with my pancakes. Either way, because we were instructed to bring the check to the cashier's desk, I brought the bill up to the hostess while Mom was using the restroom (and after I frantically ran out to the car to retrieve my wallet). I also asked for change for a $5 so that I could leave a 20% tip ($4.50) on the table for Ellen. Before leaving, I also paid a visit to the restroom. Both Mom and I found it to be clean and neat. The Pancake Man has a variety of breakfast and lunch items. 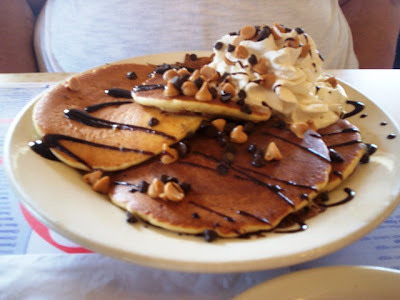 Since this was our first visit, we had to have what they were famous for - the pancakes. We already have several things in mind for our next visit. Who cares that they are all the way in South Yarmouth? We think it's worth the drive. 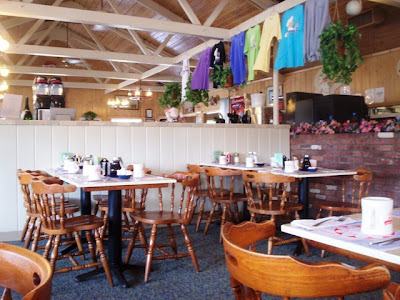 The Pancake Man is open from 7 a.m. to 2 p.m. daily from mid-February to the end of November. Breakfast is served all day and lunch is served at 11:30 a.m.